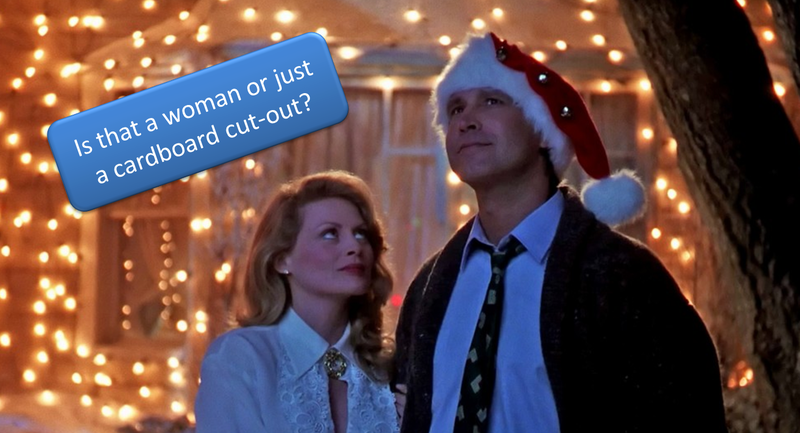 Because Christmas is around the corner, my husband wanted to watch his favorite holiday movie, Christmas Vacation, with Chevy Chase as the patriarch of the Griswalds. I also enjoy the movie and I remember loving it as a child. It‘s a good comedy. Seeing it again after many years, my opinion of it has changed quite a bit though. As a grown-up, I have interpreted it from a feminist point of view and I must say, this movie does not belong on my list of feminist movies. Why? Misses Griswald is very pretty… and that compensates for her lack of brains; check out that cleavage! Plus, did you see how she behaves and the way she talks? Life-size Barbie right there! Stereotypical supporting female character. Nowhere in the movie do we get a hint that she also has a job, so we suspect she is a housewife. Not that that‘s a bad thing. But still, she has two grown kids who could do well without a stay-at-home mom. I know I kept asking myself during the movie: does she just does not want to work or is she too stupid to hold down a job? Maybe if she had also had a job, her family would not have been so dependent on dad‘s Christmas bonus. She and her daughter do the ‘‘girl-thing‘‘ and cook for the family while Mr. Griswald and his son are responsible for the ‘‘man-thing‘‘ and decorate the house‘s exterior with Christmas lights. Typical! Why, even in the modern movies, do the men meet for football&beer on the couch while their wives cook and chat in the kitchen!? Let‘s not even talk about the low percentage of female characters and how little screen time and speaking lines they get. However, let‘s not forget the movie was filmed in the late 80‘ – as if that‘s a good excuse for misogyny. Oh, and heads up! The other Griswald movies are the same, so don‘t expect anything different! From a feminist point of view, this movie belongs in the WOMEN AS PROPS FOR SHOW category. If you want to have a good laugh with the whole family, I recommend it. If you want to see some Girl-Power, you‘d have more luck watching Powerpuff Girls. BTW, my favorite holiday movie is The Grinch. The girl leaves the rich man for the poor and ugly Grinch? Talk about love conquers all! How about your favorite Christmas movie? Are you still satisfied with it? Would love to hear your thoughts on it! Previous My Christmas this year: no tree, no presents!